Kara's Getaways and Much Much More ~~~~ Where to Go What to Do: Unique Romantic Getaways Part III ~ GLAMPING - Camping I could get into. 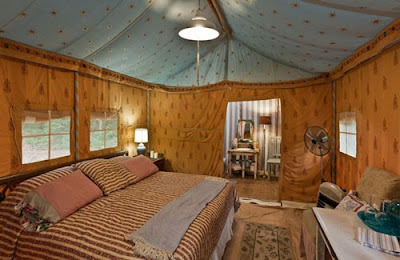 Unique Romantic Getaways Part III ~ GLAMPING - Camping I could get into. Just when I think I have reached the end of the Internet I find something new and exciting. There seems to be several blogs featuring The Martyn House due to it's fairytale like atmosphere. It just reels women in -- which can only pan out well for the men! Since I only stumbled across this place last week when I was researching for Unique Romantic Getaways I have not yet had the pleasure of staying here. Maybe this summer?? 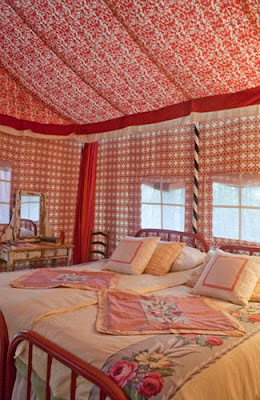 Anyway, these sweet little enchanted fairy-like tents direct from India are simply irresistible with their LARGE bedrooms and covered verandas. 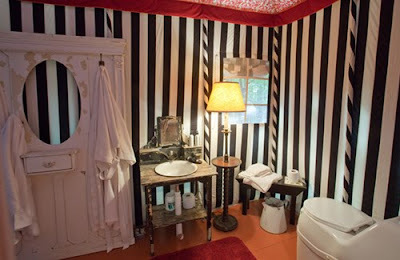 They have private interior bathrooms consisting of toilets, showers and running HOT and COLD water! 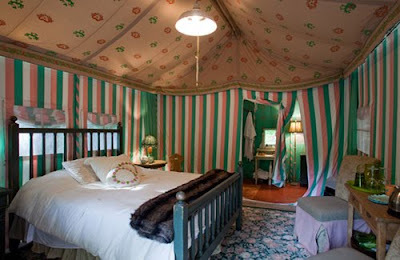 And thus the phrase GLAMPING (Glamorous Camping)! 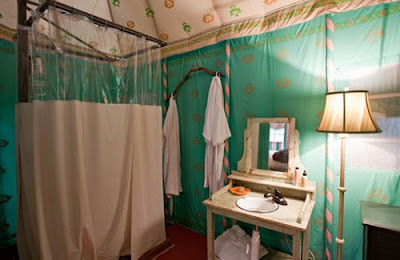 You will be pampered among the pines with luxury linens, gourmet meals, fluffy robes and even massages & yoga if you like! Your stay includes a beautiful breakfast served in the 1930's farmhouse each morning and a cocktail gathering each evening. The property is exclusive for those 18yrs and older and a minimum two night stay is required. Another way to experience a bit of The Martyn House is to attend one of their Farm to Table Organic Dinners. They host four of these a year - it is a beautiful experience that reconnects not only people to people but people to the land. Held out under the stars by candlelight with lovely music and exciting entertainment ~ it is sure to be a magical evening! The pictures of these magical nights are alluring and just make you wish you were sitting at that table.